Questions about Billy Graham's youth, his beliefs, his quotes and more. 1. After high school, from what university was Billy Graham almost expelled? 2. According to the Billy Graham Center, how old was Billy Graham when he converted to Christianity? 3. 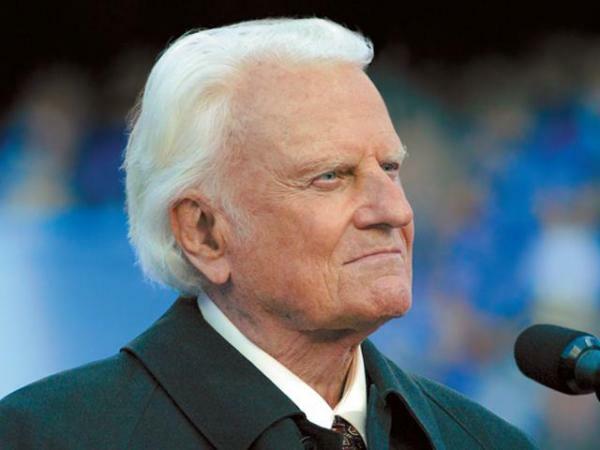 To what president did Billy Graham first serve as spiritual advisor? 4. In 1947, at age 30, Graham became the youngest person to serve as a sitting college president. What college was it? 5. What number is Billy Graham on Gallup's list of admired people for the 20th century? 6. Graham graduated from Wheaton with a degree in what field? 7. What was the name of Billy Graham's first radio program? 8. In 2002, Graham's son took succeeded his father as president and CEO of the Billy Graham Evangelistic Association. What is his first name? 9. What media mogul helped bring Graham to national prominence by providing a great deal of media coverage to a series of revivals that Billy held in Los Angeles in 1949? 10. Of what Christian denomination is Billy Graham?